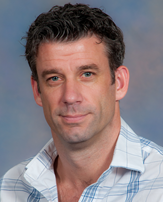 Andrew Judge is an Associate Professor in the Department of Physical Therapy. Dr. Judge received his bachelor’s degree from Loughborough University in England before moving to the U.S. to pursue a Masters degree in Exercise Physiology at McNeese State University in Louisiana and subsequently a PhD in Exercise Physiology at the University of Florida. Afterreceiving his PhD, Dr. Judge completed his post-doctoral training at Boston University studying disuse muscle atrophy. During this time Dr. Judge was a National Space and Biomedical Research Institute (NSBRI) Fellow. Dr. Judge’s research is focused on understanding the molecular signaling pathways leading to skeletal muscle atrophy caused by disuse (cast immobilization), disease (cancer and peripheral arterial disease), sepsis and aging. In addition, ongoing work in his lab seeks to understand the role that specific proteins play in regulating muscle regrowth following atrophying conditions. Currently funded projects are centered on the Forkhead BoxO signaling pathway and its regulation of skeletal muscle mass, and on the heat shock protein (Hsp) family, and understanding the mechanisms by which Hsps regulate various signaling pathways involved in the regulation of muscle mass. His lab uses genetic approaches (gene transfer, transgenics, and knockouts) to manipulate specific proteins within these signaling pathways and determine the effect on gene transcription, muscle fiber size, and muscle function. Dr. Judge’s lab uses the translational approach of studying cultured muscle cells, whole muscle, and human biopsies to comprehensively address their research questions. Eventually, improved understanding of the proteins that regulate muscle mass will lead to the identification of targets for specific interventions.